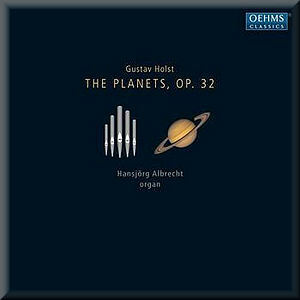 Holst’s The Planets is one of those pieces whose colourful and inventive orchestration would seem to be an essential part of a true experience of the music. That said, alternative versions also reveal the innate ability of the music to transcend its instrumentation. We’ve fairly recently come across a very good 4-hands piano version of the work on the Nimbus label (see review). There are also recordings with brass band but I had never come across an organ recording like this before. Holst himself wrote the piece originally in a version on two pianos, apparently reserving Neptune for organ. The final orchestration includes organ as part of the full score, and one of the early thrills of my experience with CD in the 1980s was hearing that instrument thunder through moments of Charles Dutoit’s Montreal Decca recording, a version which is still a firm favourite amongst many fine releases in the current catalogue. The booklet goes into a description of each planet and Holst’s musical treatments – at which stage I would point to Paul Serotsky’s excellent programme notes on the piece - but doesn’t give away much on the subject of the organ transcription used for this recording. The organ itself is a crucial factor in such an undertaking, and the two instruments used here are stars in their own right. First there is the Cavaillé-Coll-Mutin organ, restored and installed in the St. Nikolai in Kiel in 2003/4. This is combined with another larger organ, which is a 1965 instrument by Detlef Kleuker. Once again it would have been fascinating to know how these instruments have been coupled, or which makes what contribution to each movement. Some effects are clearly modern, such as some of the rather cheesy celestial sounds in Venus, the Bringer of Peace, but I’m the kind of listener who likes to know what he is consuming, and knowing the hunger for technical data most organ buffs have it would have been nice to have had a bit of a lecture on the subject. Some information on microphone placement and the SACD balancing would also have added to the juicy enjoyment of such an unusual disc. As you can imagine, there is plenty of spectacular sonic content on this recording, but the real impact is less in massive volume of sound and trouser-flapping bass, and more in the sheer diversity of colour available from these sources. Yes, we miss the menace of percussion in Mars, the Bringer of War, but Hansjörg Albrecht’s articulation manages to communicate plenty of rhythm, and the actual mechanics of the organ add their own distant rattle of advancing armour. The harmonies swell and develop into a convincing mass of sound which generates its own highly convincing orchestral effect. If you don’t like organ, then this version of The Planets isn’t going to convert you, but if you like The Planets then this is a powerful alternative to have next to your favourite orchestral recordings. Pretty much all of the top moments in the piece are ‘hit’ with convincing effect. The big tune 3:38 into Jupiter for instance, is perhaps a smidge on the slow side, but is stirring as ever. The organ does have a way of expanding tempi just a little, with a little more weight and heft needed to manoeuvre through some of the tighter corners, but Albrecht avoids making the music sound laboured. This is all a question of context, and some of these moments would attract criticism if they were to appear in the same way with an orchestra and conductor. With the organ you become accustomed to the piece as if it were being driven by a different vehicle: a single rather refined and impressive juggernaut rather than a fleet of multi-coloured Ferraris. Some of the subtler moments are amongst the most magical in this recording. Saturn, the Bringer of Old Age is particularly well shaped, and with some wonderful chimes from the 7th minute. The dancing quality of Uranus becomes somewhat elephantine on organ, but again context is everything, and Albrecht’s articulation keeps things dynamic; and the oom-pah pedal bass notes are a life-enhancing treat. That organ on Dutoit’s recording is spectacular in this movement, and one of the equivalent moments between 4:55 and 5:00 is here given rather short shrift with an upward sweep which might have had a little more substance. Those subsequent atmospheric chords here and later on are suitably chilling however, and the transition to the final movement, Neptune, is perfectly timed. The treatment of the music in this movement makes it least like the orchestral version than any of the others, with chords undulating and spread like lapping waves. This generates a fine sense of mystery, but takes a little getting used to. The final passages at which the chorus would normally enter is done with sensitivity and plenty of other-worldly mystery, and all of that sense of infinity the music needs. This is a remarkable recording to have around; and just one of many from Hansjörg Albrecht on the Oehms Classics label. No, it’s not the best The Planets ever and shouldn’t be seen as a principal reference, but as a transcription it is remarkably successful in my opinion, though I’m sure there are purists who would disagree. Hi-Fi buffs and seekers of SACD sonic thrills can have plenty of fun with the recording, and have no need to bring it out like a secret vice when there is the pleasure of so much fine music to be had.